This title was first published in 2003. Most European cities have experienced problems in certain neighbourhoods that are termed deprived or excluded. Traditionally these were found in the oldest urban areas with lowest quality housing, but since the 1980s, such areas have emerged in housing estates built around the cities' edges. These neighbourhoods are marked by visible physical and social problems that disfigure the otherwise pleasant urban landscape, and can be seen as urban sores. 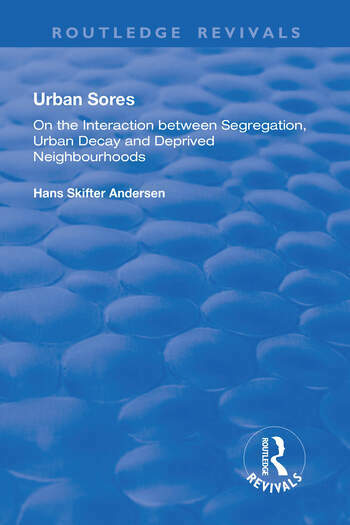 This engaging and thought-provoking book provides a deeper understanding of why urban decay and deprived neighbourhoods appear in certain parts of cities, as well as how they affect residents and cities in general. Drawing on in-depth empirical research from Denmark, it compares this with other studies from Europe and the United States. The author combines theories and methodologies from the fields of geography (on segregation), economics (on processes of urban decay) and social research (on social exclusion and deprived neighbourhoods) to provide original, illuminating and invaluable insights. Contents: Introduction; Social segregation in cities; The appearance of urban decay and deprivation in Western cities; Explanations of decay in the urban housing market; Processes of social and physical decay in deprived urban neighbourhoods; Understanding deprived neighbourhoods - the connection between segregation and neighbourhood decay ; Efforts to combat urban decay; Bibliography; Index.